Vinten Vision Blue Pan and Tilt Head incorporates adjustable spring counter balancing mechanism, LF drag assemblies for pan and tilt motions, and an adjustable camera mounting plate with 1/4″ screw and pin assembly. Easy to access placement of pan and tilt brakes, drag controls, and counterbalance enables you to easily adjust camera settings. Illuminated level bubble allows for head adjustment in locations with low lighting levels, and can provide 15 second illumination by pressing the push button. 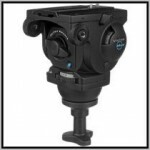 The Vinten Perfect Balance technology enables load balance between 4.6-11 lb (2.1-5 kg) with a low centre of gravity of around 2.2” (55 mm), and allows the Vision Blue Pan and Tilt Head to balance the smaller lightweight cameras. The Vinten 3819-3 Pozi-Loc tripod is a precision-engineered two-stage, aluminum tripod. It offers a 75mm-bowl and Pozi-Loc leg clamping system. This lightweight, compact tripod is quick and easy to set up and provides excellent operational flexibility.